Model description and poly counts : Soldier version 1 (rigged) : 40560 polys, 21097 vertices -includes shoulder pads, ballistic visor, large backpack, radio+handset, webbing and ammo packs. Soldier version 1 LOD: 20203 polys, 10877 vertices. Soldier version 2(rigged): 37805 polys, 19678 vertices -includes hydration backpack, drinking hose, grenade belt, webbing and ammo packs. Soldier version 2 LOD: 19330 polys, 10047 vertices. 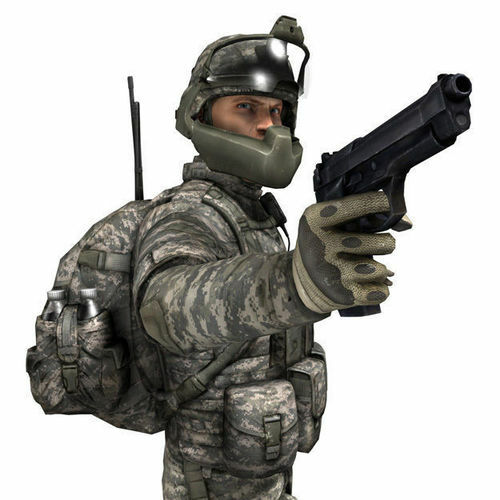 Soldier version 3(rigged): 16760 polys, 8544 - basic soldier with helmet and all webbing and equipment removed. Soldier version 3 LOD: 8744 polys, 4499 vertices. pistol: 4468 polys, 2434 vertices. Texture details: Diffuse, specular and normal textures are supplied as tga's and include two versions of camouflage. Diffuse textures: 3 X 8192 textures for the main character and equipment. 1 X 4096 texture for the head. 1 X 4096 texture for the helmet and ballistic visor assembly. 1 X 2048 texture for the clear visor and water bottles. 1 X 4096 texture for the 9mm pistol. Specular and normal tga's included for each diffuse texture. Soldier is rigged using skin modifier, character studio biped and dummies for the extra bones and facial rig. FBX exporter has been set to convert dummies to bones. The skin is set up using painted weights and vertex blending .